In a discussion period at a leadership forum, the former president was asked about his wife Michelle’s comments this week during a speech in Toronto, when she said it was not a good idea to “tweet from bed,” an obvious commentary on Trump’s early morning Twitter habit. Lou Dobbs went apoplectic on that one. Consider my mind blown. Since when is advice to think before you speak or tweet the least bit controversial—much less cause to send the marshals out to get you? Dobbs ends his rant by asking whether or not there is a law that former presidents shouldn’t be attacking sitting presidents. According to some people on Facebook, apparently there is. 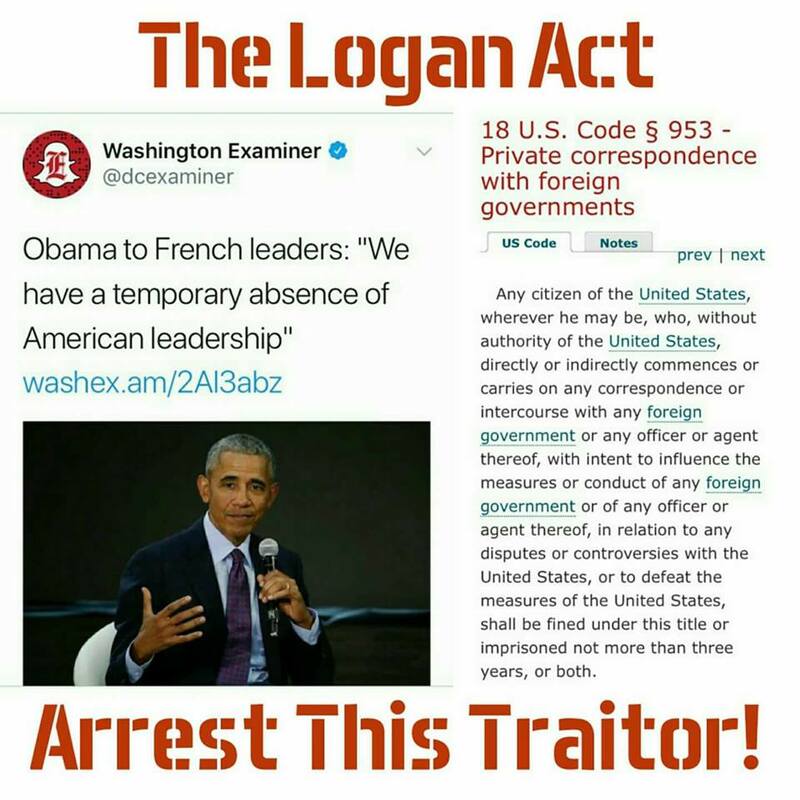 In case you were wondering, that was posted on Monday, the same day that there was a lot of talk about whether Michael Flynn violated the Logan Act. Coincidence? You tell me. After returning from his trip abroad, Obama gave a speech at the Chicago Economic Club. When a man like him starts talking like this, it’s beyond time to pay attention. Of course the same people who, when Obama was president, questioned his citizenship and assumed he was a Muslim in league with the terrorists lost their marbles over that one. Obama’s implication that Trump represents a threat to democracy or even the lives of American citizens and that the situation in the country is akin to 1930s Nazi Germany is clearly demented. What amazes me is that, even as Obama’s term in office is over, these people can’t let go. Perhaps because they spent eight years demonizing the man, it simply became a habit. But I actually think its more than that. For authoritarianism to flourish, it needs an enemy. Neither Trump nor his supporters can be content with winning. They need someone to play the villain in their drama. Until Democrats nominate their next leader in a presidential candidate, that role will be played by Hillary Clinton and Barack Obama. All either one of them has to do is open his or her mouth and the conspiracy theories will fly.